This month I’ve been talking about the benefits of writers’ critique groups, so you might be wondering where you can find one to join or how you can create your own. Here are several places I and writers I respect have found excellent writers groups or members and what you need to think about when building your own group. The first place – and in my experience easiest one – to find a critique group or new members is by taking writing classes. This includes everything from community courses to graduate degree programs to writers’ conferences. When writers take classes, it’s because they want to learn and improve. Those are the kinds of people you want in your critique group. You will also get a feel for what and how these other authors write in class, so you can invite people who will mesh with your style and the dynamics of your group. Ask your peers to see if anyone has a critique group in need of another member or if they are looking to join a group themselves. Make it known you are looking for a critique group. 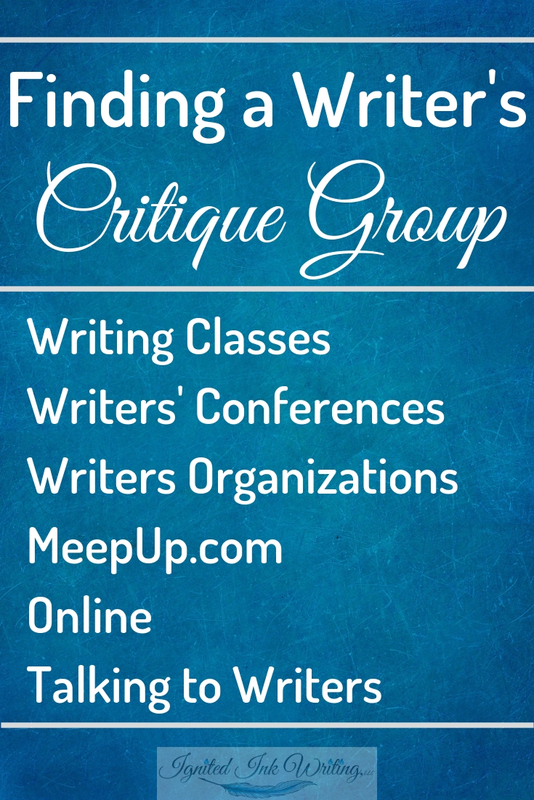 Another place to look for critique groups and new members is writers’ organizations. Depending on the organization’s size and focus, they might have multiple writers’ critique groups, one, or a list of groups run by their members. Reach out and let them know you are looking to join a group or ask them to announce to their members you are starting one and accepting new critiquers. You will get a better response if you are an active member of the organization. Talking to other writers in general is a great way to find a critique group, and writers’ organizations are filled with writers. If you are new to an area, join your local fiction, nonfiction, romance, sci-fi, or thriller writers’ organization to plug into your new writing community. Many writers groups have an account on platforms like MeetUp or Mobilize. You can search their directory for writing groups in your area and reach out through the platform. Critique groups often use these platforms because they offer file sharing and private messaging for the group. I found two critique groups this way. Online writers groups are becoming more and more popular. These are people who don’t meet in person, but trade pieces over the internet and offer feedback virtually. You can find a plethora of these groups and platforms by googling “Online Writers’ Critique Groups.” These are great for people who write in an isolated area or have a day job. What days and times do you meet? How long will your meetings last? Most groups I’ve been a part of meet for 2-3 hours to discuss their members’ pieces. Weekday evening and weekend groups work better for most writers due to day jobs. How frequently do you meet? Weekly, every other week, or monthly? This will depend on how prolific your members are and how many pages you look at each meeting. There are several free spaces available for critique groups. Alfalfa’s grocery stores and libraries have community rooms. Churches will let their members use their meeting rooms. Barnes and Nobles have plenty of tables and would love to reserve them for writers. Coffee shops can be noisy, but are another great option. Some groups meet at a member’s home or the apartment complex’s community room. You might have to try a few different times, days, and spaces before you find the ideal environment for your critique group. There are several things to consider when it comes to submitting pieces for critique: who submits, how many pages/words, and in what format. If everyone submits every time, most likely each person will be submitting 5-8 double-spaced pages depending on the size of your group. If you take turns, each person will be able to submit more words/pages when it’s their turn. Most critique groups require standard submission format: double-spaced, 12pt font, Times New Roman or another easy to read font, and page numbers. This is the standard because it’s easy to read, has space for comments, and makes sure everyone is on the same page during the critique. You might adjust this depending on the needs of your group. You will also need a submission deadline. Most groups require pieces to be shared with the members no later than one week before the meeting. This gives members time to read through everyone’s pieces and mark their feedback. You will need to find the ideal etiquette for your meetings. Are people receiving critique allowed to speak? Often the author of the piece being discussed must remain silent until everyone has had a turn to make comments. Then the author will have time to ask questions. When you have a larger group, you might need to use a timer to make sure each person is able to give their feedback and each piece is given the time it deserves. You may also need to find a way to make sure the same person doesn’t go first or last for every critique because this can make members feel like they aren’t as valued. It is always good to have a document of your critique group’s guidelines where the nuances of your group are spelled out in detail. That way new members will find it easier to fit in and you can remind old members of the guidelines if the group is starting to derail. If many of your members are new to critique, you might request they read The Dictionary of Fiction Critique by Kate Jonuska, so everyone will understand what they are looking for and what is meant by phrases like floating heads. I have been in charge of multiple critique groups over the last six years, and I can tell you it isn’t easy. There will always be someone who tries to submit significantly more pages than everyone else, who tries to dominate the discussion, or who needs a bit of hand holding before they feel comfortable. As the leader, it is your job to make sure everyone is adhering to the guidelines your group has agreed to. When addressing a concern about a specific member, be sure to speak to that person privately. If you have trouble with confrontation, email them. Approach that member with a solution or two. Like in critique, you want to be constructive. I had a member recently submit a document in the wrong format, so I emailed them asking for a double-spaced version of their piece. I told them exactly what they needed to do to meet the group’s guidelines. As the leader, you should be able to be approached by members with a concern they didn’t want to bring up in front of the group. If one member feels another isn’t following the guidelines, the concerned member should be comfortable coming to you to discuss their feelings. You then should do your best to find a way to address their concerns. Now that you know where to find members, how to start your group, and what is expected of you as the leader, it’s up to you to find a critique group to Ignite Your Ink. Where have you found critique groups in the past? What has and has not worked for you? Share your experience in the comments below. For a copy of one of my critique group’s Critiquing Guidelines, subscribe to Ignite Your Ink.